Indian Navy’s latest surveillance ship, INLCU L51 was commissioned today(28 March 2017) and it will be part of the fleet deployed to check poaching, illegal fishing, drug trafficking and other unlawful activities in the Indian Ocean region. The ship was commissioned by Vice Admiral Bimal Verma, Commander-in-Chief of Andaman and Nicobar Command at Port Blair. It is the first of the eight ships of the LCU Mk IV Class and has been built by M/s Garden Reach Ship Builders & Engineers Ltd, Kolkata. With a displacement of 900 tons, the ship is 62.8 metre in length and 11 metre in breadth. The ship will also play a key role in carrying out maritime surveillance of Andaman & Nicobar Islands for preventing anti-poaching, illegal fishing, drug trafficking, human trafficking, poaching and other illegal activities. The armament onboard the ship include 30 mm CRN -91 guns, 12.7 mm Heavy Machine Guns and 7.62 mm Medium Machine Guns. In addition, the ship is fitted with state-of-the art Electronic Warfare suite for early detection of adversaries. Mk IV LCU class vessels are operated by the Indian Navy to augment the Indian Navy’s amphibious capability. India currently has six LCUs of the Mk III class and four LCUs of the Mk IV class. The ship can be deployed for maritime roles like maritime security, beaching, un-beaching, humanitarian relief operations and evacuation from distant islands, search and rescue operations and peace-keeping missions. The LCUs will likely be inducted into the tri-service command responsible for India’s Andaman and Nicobar island territory. The Indian Navy is developing the chain of islands as an amphibious warfare hub, possibly to counterbalance China’s growing military influence in the Indian Ocean Region. The craft may also operate in the Arabian Sea. The remarkable feature of these LCU Mark-IV ships are that, these have been developed in-house by GRSE as per requirements specified by Indian Navy. The ships are designed for multipurpose amphibious operations that are jointly carried out by Indian Navy and Indian Army for ensuring maritime security of Andaman and Nicobar Islands in the Bay of Bengal, and Lakshadweep Islands in the Arabian Sea. The ship is 63 meters long, overall beam of 11 meters, a hull draught of 2.2 meters and displaces around 830 tons. 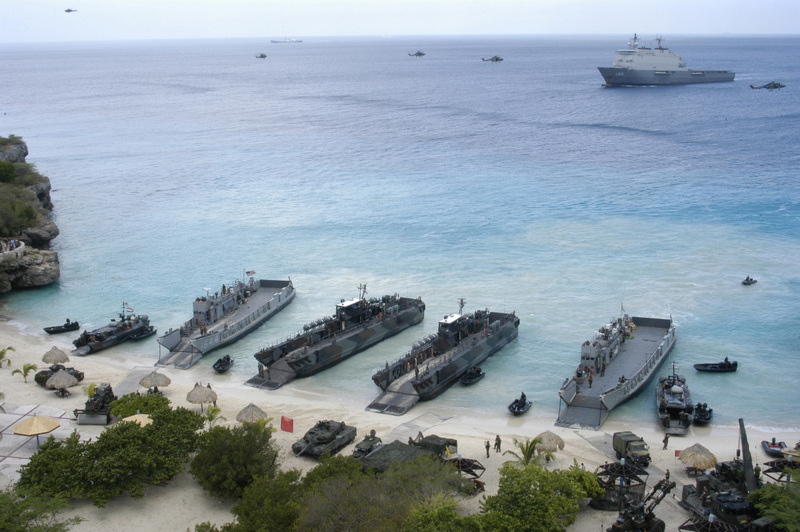 They can transport by sea and beach at far away islands, to deploy army tanks and troops. With a maximum speed of 15 knots and an endurance of more than 1500 nautical miles, the ship is driven by twin-propeller fixed-pitch propulsion system powered by two MTU 16V 4000 M53 marine diesel engines (each 1840 KWs). Each engine drives a Fundivisa-supplied fixed-pitch propeller through a Reintjes WAF 763 P reversible reduction gearbox. Two 30mm CRN-91 mounted guns with a Bharat Electronics-built EON-51 electro-optic director provide artillery fire support during landing operations. The LCU has lift capacity for up to 216 personnel, including 160 fully equipped soldiers and 56 crew and 145 tonnes of military equipment. The vehicle lift capacity is one 65 ton tank like the Arjun or two 45 ton tanks like the T-72/80, or four 13.5 ton BMP Infantry Fighting Vehicles. It is fitted with a hydraulic bow ramp which enables loading and unloading of combat equipment and vehicles on beaching. Ballast arrangement further ensures desired trim for smooth beaching operations.